Subaru will be changing the all too familiar sedan shape of it’s rally-inspired Subaru Impreza car to a hatchback form when it’s next incarnation is introduced in 2008. We’ve kind of known this was going to happen when Subaru showed us the Subaru B5-TPH Concept at the 2005 Tokyo Motor Show. 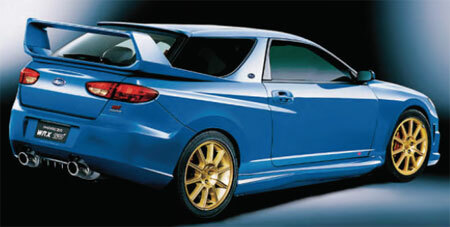 Shown above is an artist’s impression from Road & Track on how the Impreza hatch could possibly look like. This move is in line with Subaru’s plan to position the new Impreza hatch against hot hatches like the Golf GTI, Golf R32/R36 and the Ford Focus. A preview of the final production vehicle will be shown next year at the 2007 Tokyo Motor Show. The car will come in both 3-door and 5-door models. Engine options are expected to be a naturally aspirated 2.0 litre four-pot boxer producing 170 horsepower for the baseline model, and the WRX versions will have a turbocharged version under the hood. STi versions will have a higher performance turbocharged four-pot boxer producing over 300 horsepower. There will also be four-pot boxer turbodiesel options, developed together with Toyota. Of course, the car will retain it’s trademark AWD drivetrain.